Alice Waters is pretty my much idol. She was into local food before it was a thing people were into, and now that she’s got that sorted, she’s moving on to saving school lunch. So even though this carrot soup recipe looks ridiculously simple, you’re going to want to take her word for it that it’s a good idea. 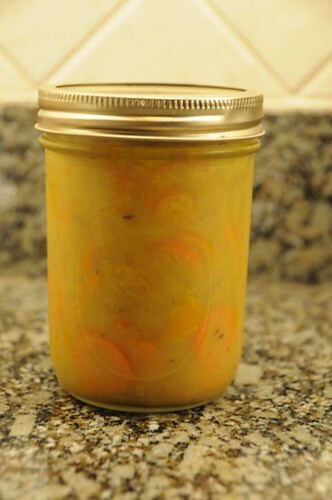 First, peel the carrots and then slice them thinly. If you’re me, this means using a food processor with a slicing blade or a mandoline, but those with better knife skills should not hesitate to use them. If your carrots are fat, you might want to halve them before slicing. Put the butter in a pot over medium-low heat. 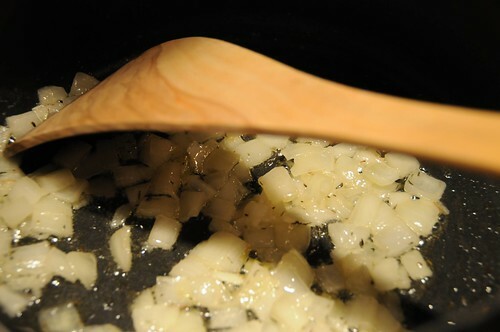 When it melts, add the onion and thyme, and cook slowly until the onion is quite soft, about ten minutes. Add the carrots and cook for five more minutes, stirring once in a while. Add in the stock and turn the heat to high. 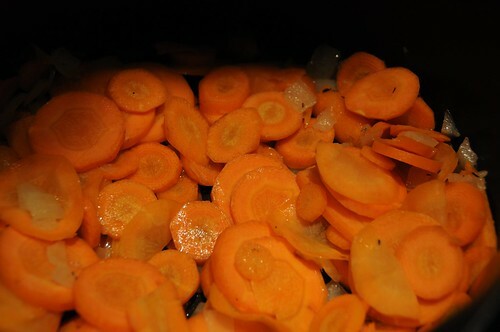 Bring the whole thing to a boil, and then reduce to a simmer and cook until the carrots are tender. How long this takes depends on your slicing, but half an hour is a good first time to check. I ate this straight up; Alice recommends a sprinkle of chives, and there’s a reason she’s Alice Waters.